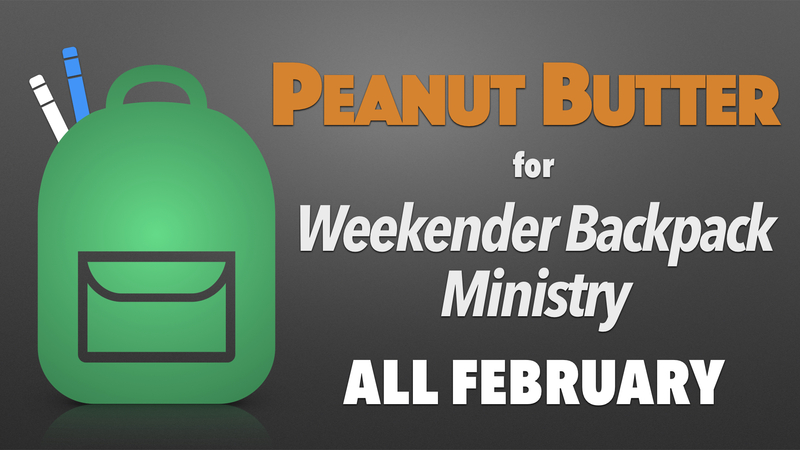 Donate creamy peanut butter to our Weekender Backpack Ministry and help give kids an extra boost of protein during spring break! Spring break will be here soon and the Weekender Backpack Ministry needs your help. In addition to normal weekly items, we want to give the kids some extra protein over the long two-week break. Throughout February, we are collecting donations of peanut butter for 299 students: 16 oz, plastic container, smooth/creamy. We will put a container in each kid’s backpack the Thursday before spring break. We know this will make their backpacks a little heavy, but they will appreciate having something that stretches a little further over the two weeks they are out of school. Any contribution you can make is appreciated. Place your donations on the Weekender Backpack shelf of the white racks outside Resurrection Hall. Thank you! Questions? Contact Jennifer Prickel or the parish office at parishadmin@rlcindy.org or (317) 881-7854.